Nursing homes provide quality care to many elderly and disabled individuals, but research proves the majority of people prefer home care. When seniors are allowed to remain in their own homes, it affords them a sense of dignity and a better quality of life. Despite the many advantages of in-home care, many older ones are still being placed in nursing homes unnecessarily. How can families help their loved ones to stay at home? What are the best homecare solutions? These tips can help. Big cities generally have a higher cost of living, as well as coastal areas. Although moving may seem drastic, relocating to a less expensive area may make it possible to afford in-home care. Moving also makes sense if you can find a place near a family member willing to provide care. Even if hiring outside help becomes necessary, having a family member nearby who is responsible for overseeing care will reduce extra expenses. For families looking for an extreme change, consider a move out of the country. Large retirement communities have sprung up in many different countries, including Mexico, where the cost of in-home care is considerably lower. Be sure to check out the local immigration restrictions, health insurance coverage, and whether the cost of moving makes the relocation reasonable. Pooling resources and sharing responsibilities is a great way to keep elderly parents in their homes. If the person you’re caring for lives in the same apartment building or on the same block as someone who also needs in-home care, it may be possible for them to share caregivers. Taking your loved one to a neighbor’s home even for a few hours a day means one caregiver can care for two seniors at once – cutting costs in half. Make sure you discuss details with the caregiver first so there are no discrepancies later. Moving in with a relative or friend is also a good care solution. Ask each of your family members if they have the extra space, but remind them you’ll be there to help. A skilled caregiver can cost $20 to $30 an hour – or more. If insurance doesn’t cover this level of care, consider what type of help is really necessary. Is a professional caregiver required the entire day? Some seniors only need assistance at certain times, such as morning or bedtime. 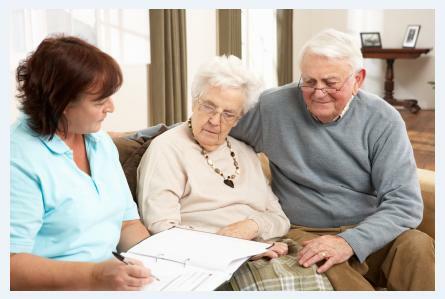 Most in-home care agencies offer different levels of care, including lower-cost companion care. Carefully review your family member’s insurance coverage to determine what level of care is covered. Personal home care is available for those who need non-medical help with various aspects of daily living, and can give family caregivers a much-needed break. It’s highly recommended to work with an agency who offers ClearCare care management software – a point of care system that allows you to stay completely involved with your loved one’s daily care. Utilizing this reliable caregiver software will not only give you peace of mind, but it ensures the best possible care for your loved one. With abuse of the elderly on the rise, don’t take this innovative technology for granted. If your property has the space, you could build an accessory dwelling unit, sometimes called an ECHO (Elder Housing Cottage Opportunity). These small buildings can be designed with special features for the elderly, such as safety rails and wheelchair ramps. Carefully review your city’s zoning laws and get an estimate of the entire project. It may be expensive, but still less pricey than long term nursing home costs when seniors really only need a little assistance to maintain their independence. Make sure you check out next week’s blog for 5 more great tips!